.NET is a modern framework and it was designed with internationalization and globalization in mind. It has all necessary tools for software globalization and provide functional framework for .Net localization. When you develop .net application for international market, you place all localizable resources in resource files. If you want to translate your .NET application into different language, you create a specially named copies of resource files and place only translated(localized) elements in them. This helps remove duplication of entries during .NET localization. It all sounds good and great, but the problem is that Microsoft has not provided a software for painless editing of those localized resource files. Microsoft Visual Studio does not have an integrated translation environment where translator or project manager can control progress of .net localization. Built-in form editor in Studio supports creation of localized resource files, but in very cumbersome way. You can not control how many resources you translated or how many elements you have not translated. You can not see all elements that need translation in one place. If you need to localize you application into one or two languages and your application is small, you can use Visual Studio for localization, but otherwise .Net Localization project becomes truly unmanageable. 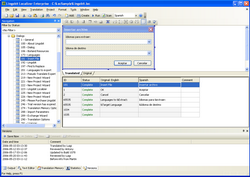 However software localization tools such as Lingobit Localizer significantly reduce efforts necessary to localize .Net application. Translator is able to see all elements slated for translation in one place, and he can do all the necessary work from one place. He does not need source code to perform localization, so you do not need to entrust him with trade secretes. Project manager can use sophisticated report functionality of Lingobit Localizer during .net localization to score progress, and that leads to well-managed and on-time projects. Lingobit Localizer has visual editor for localization of .net forms, so can rearrange and resize elements to fit translated text without Visual Studio. Localization of software application is necessary in contemporary global market. If you produce an application in only one language, you forfeit at least 60% of your revenues or even more. Localization of a .net application may cost you only 10% effort, but bring much more in revenues. And with tools such as Lingobit Localizer, which saves time and money during localization, you can reap benefits of global software market without any hassles.